Are you wondering what all the fuss is about with the magic needle, also known as dermal filler treatments with cannulas? Until now needles have traditionally been sharp edged and pointed which can cut through the skin and cause trauma, bruising and pain. Whereas the magic needle or aesthetic cannulas are round ended causing less pain, little trauma and eliminating the risk of ecchymosis. A great example is the lip filler treatment. In this area the lip can swell much more than any other area on the face when it’s treated, but when treated with the a magic needle the area doesn’t swell as much and the risk of ecchymosis is eliminated. 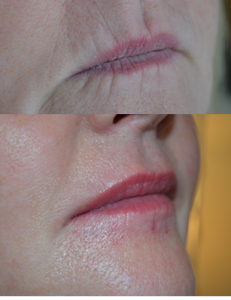 Take a look at this image of before and after a lip filler treatment using a cannula. These images were taken within 30minutes of eachother and is evidence of a great reason to switch tools.